Default on desktops too? Hmm. Metro UI; That’s the name of the new user interface that Microsoft plans to ship with the Windows 8 operating system when it comes out next year. What we did not know until now was how the interface would be integrated into the operating system, especially so on desktop PCs. Many users suspected that the new UI would only be turned on by default on tablet and touch based devices, and that desktop users would get the standard interface instead. That is not the case according to Steven Sinfosky. 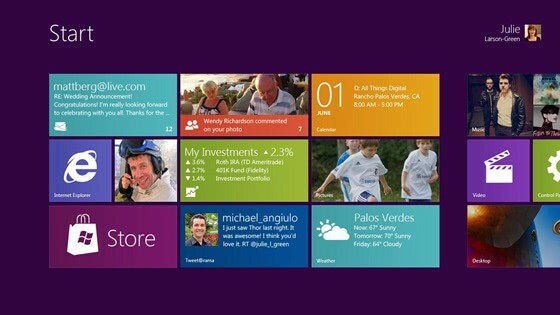 Windows 8 will ship with a dual user interface. The main interface is Metro UI which gets loaded when the operating system starts. Desktop UI, which Microsoft basically sees like another app on the system, is not loaded until the user needs it. It is not clear from the post if users will be able to switch to the desktop UI as their primary interface so that Metro UI is not loaded at all. What I do believe however is that many customers will be in for a shock when they start the operating system for the first time. The majority will expect an interface that looks like those of previous versions of Windows. It will be more than interesting to see their reactions when the PC boots into Metro UI. We need to wait a bit longer until we know if users, manufacturers and companies will be able to customize the user experience so that the desktop UI will be loaded instead of Metro UI on startup. Can I select to run the desktop UI on startup right away? Can I disable Metro UI? Metro UI to me looks like an interactive launchpad for applications. Correct me if I’m wrong. How am I going to run popular operations from there? How is Metro UI faster or more convenient than the desktop UI in this regard? Take downloading an application and installing it for instance. How am I going to run the downloaded app in Metro UI? How do desktop users benefit from the new interface, apart from the prettier looks? What can Metro UI do that the traditional desktop cannot? My personal opinion at the time of writing is that Metro UI could be a great addition for users who do not do a lot of different things with their computers. Regular users who use it for Office, web browsing, light gaming and media. To me, it looks like the interface is made up of lots of widgets that are configurable by the user and expanded to run in full screen. Here is a video of Metro UI in action.